Special dates and times will always exist. That is why we have been concerned with providing you with a resource that allows you to create beautiful card designs for memorable events like a professional, surprising your clients with the results. 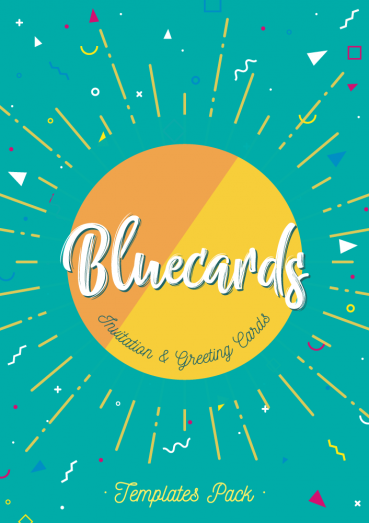 Bluecards, is a template package of 8 (A5) cards designed in Adobe Illustrator ready to print and as usual, easy to customize. Your texts, images, graphics and backgrounds have been organized in layers to make your work simpler and so you can create your own designs whenever you want; you will also have completely original hand drawn vectors organized equally in layers. In this package you will find: 1 birthday card, 1 party invitation, 1 wedding invitation, 1 anniversary invitation, 1 quote card, 1 valentine’s day card, 1 graduation announcement and 1 baby shower invitation, 8 of the most common ideas in card creation. The mockups used to present this item from the Original Mockups Store are: Card Mockup 06, Card Mockup 03 and Card Mockup 04.